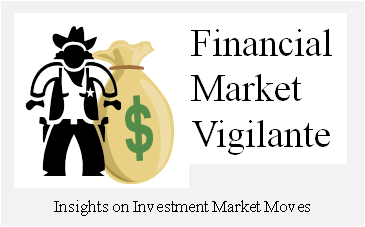 Financial Market Vigilante: How Worried Should You Be about Your Investments Now? Currently returns for investors who bought the DOW market index 12 months ago is 12.4%. The market, because it has an upward bias through time, rarely signals negative year-over year returns once it has exited a prior correction until it is undergoing another major correction. The year over year major market return decline pattern is a trusted signal savvy investors anticipate to tell them when it is time to get out of the major US equity markets. What investors are left to assess at any particular moment are the odds that such a break-down is imminent. Otherwise, my research shows they should stay fully invested, focusing primarily on proper portfolio balance relative to their risk tolerance. I use several variables to assess the immediate risk. 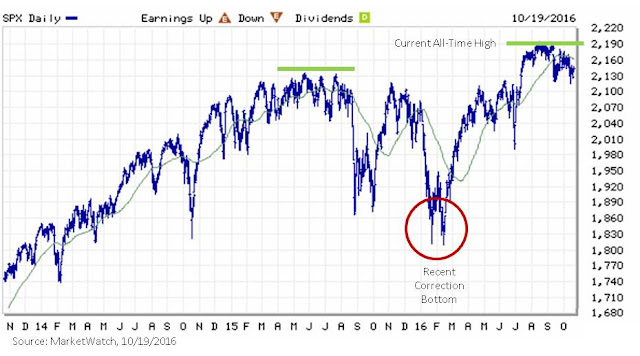 One factor that adds to the risk is the market making new all-time highs since the last correction. Currently since the market bottomed in early 2016, new highs have already been reached. The fact that the market recovered to a new all-time high so quickly after a correction is, from a historical perspective, and odd event. The all-time market signal condition puts the market at greater risk based on history for another correction to occur. However, it says nothing about when it may occur. My observation is that the last downturn was driven by a profit recession in the oil patch and a brief shift in international capital flows. However, the market correction did not correspond with a U.S. economic recession. The next time market risk rises to an elevated condition, as measured by the Financial Relativity Market Risk Index, odds are high that the market will move lower for a much longer period of time. Another factor I review is how expensive the market is relative to historical valuations. Since most of my market research involves market valuations relative to economic output, I look at major market indices such as the DOW and S&P relative to current GDP. Looking back through history, a factor of 1 on the DOW relative to GDP puts the market on the cusp of being in the over-valued warning zone. Given the low economic growth in the U.S. and the world economies, the current high valuation relative to GDP is much more of a risk if expectations for higher growth do not materialize. Historically a factor of .8 for the current economy has been the norm. I attribute the distortion to the Fed effect on stocks from their elongated zero interest rate policy. If I can predict perfectly when stock investors are going to realize that their stock returns are about to turn negative year-over-year, then the technical model that I follow is all that is needed to out-perform the market. But the trick is to predict when the risk level is going to suddenly jump to 10 or higher. I say suddenly because the change ahead of a steep market decline usually comes with only a brief period of time to assess whether a pull-back is going to be a deep one for an extended period of time. Currently my opinion is that the next market break-down will be much stronger and lasting than the one experienced at the end of 2015 and early 2016. The question is what market signals can investors use to assess the risk? For this assessment, I use seven market factors tracked on a monthly basis to create a Financial Force Risk Index. These factors have been chosen based on research done using data since WWII to track the relative performance of the stock market as these factors change. The forces and their impact form the foundation of Theory of Financial Relativity, a book that I published in 2013. At present the Financial Force Index is not as calm as the technical Market Risk Index. The index is currently on the low end of the warning zone. Growing risks are being indicated in over heated lending markets that are beginning to slow down, particularly business and consumer loan markets. The long awaited interest rate policy reversal is also a growing risk. But the biggest factors that tend to show up prior to trouble in the stock market that are evident currently are a reversal of international flows of capital to finance the U.S. debt at the same time that there is mounting pressure to increase fiscal policy to spur the U.S. economy. If this scenario plays out post the 2016 U.S. Presidential election, I fully expect the green markers in the Financial Force Index to show more risk than today, putting the current stock market valuation at much higher risk of a major downward correction. What is the evidence that the loan market is turning from a positive to negative force on the market. The answer is in the relative direction of lending activity. Loan defaults is also an indicator, however, the default rate is a trailing indicator, because the flow of loans into many products such as commercial real estate, leverage buy-outs, auto loans, student loans have been perpetually higher in recent years. The result has been new loans to cover past mistakes rather than defaults. This mode of operation is the normal course of business for banks, until the money runs out as the banking system begins to restrict new loans in markets that are already historically stretched. Currently the statistics show the money to make new loans appears to be running out. In the table below, you can see a couple of red boxes which show business loan and consumer loan activity relative to US GDP. The values for both markets are at all-time highs and both are at risk of undergoing contraction at the current time. The yellow box in the table which shows that the balance of business loans outstanding are growing slower than GDP over the last 12 months is one of the best indicators I have found to watch out for as a risk of an approaching recession. What are the odds that a business cycle recession is approaching? The best evidence I have dates back to 1997 covering the last two down-turns. 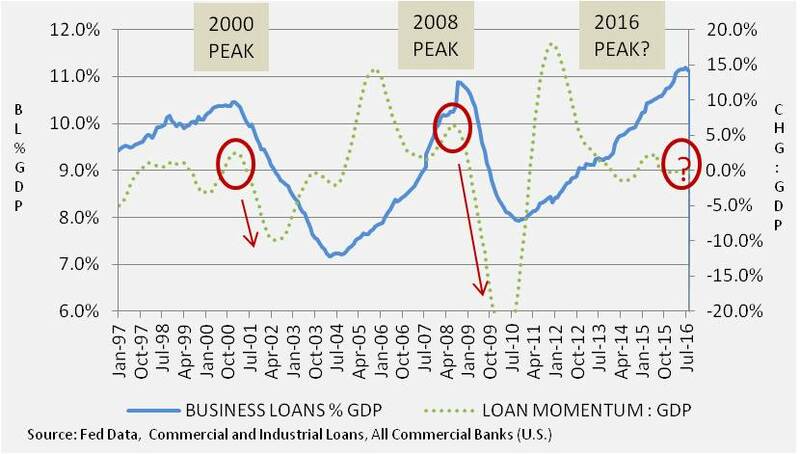 Note in both the 2000 and 2008 scenario, business loan activity relative to GDP growth dropped off sharply into negative territory as the recession took hold. The rate of investment leading up to the downturn was not strong, and was showing leading signs of weakness. The current business loan market, given the over-extended nature of the market relative to historical standards, means the risk of a business cycle recession is very high at the present time. Ironically, mortgage loan activity has been the saving grace in the U.S. economy over the last year. The data show that the de-leveraging in the mortgage market that ensued post the financial crisis in 2008 reversed mid-2015, almost precisely at the same time that oil prices plummeted and the U.S. dollar went up substantially. My observation was that regulators lightened up on mortgage conditions at this time as the return of the 3% down payment mortgage returned and long-term mortgage rates headed to historical lows. As luck would have it, the good fortune fell just one year ahead of a U.S. Presidential election. U.S. mortgage loans are on pace to increase over $600B over the past year, a substantial economic stimulus in an otherwise struggling economy. The question remains whether the new loans can be serviced if the economy enters a downturn. Equity markets expand in value as investment dollars continue to freely flow and returns are sufficient and capital risk low enough to keep investors from selling. The Financial Relativity Index currently shows investors remain satisfied with their present risk adjusted returns. However, there is growing evidence that the free flow of capital into a broad range of investments is under-going a disrupting slowdown. The seemingly perpetual flow of more and more debt into various markets to support financial valuations is slowing down. Without the debt market for fuel, both domestically and internationally, my forecast is that the stock market will suffer. Moving forward, stocks are at high risk of a substantial prolonged downturn as the dysfunctional US government will be looked to for a fiscal policy bail-out the next time trouble is signaled in the market. The Fed can do little now except prolong a debt cycle that is over-extended, at the risk of making the eventual down-turn even worse. The international markets will also provide little, if not negative support going forward as capital flows from petro-dollar re-cycle and EU and Japan QE are no longer U.S. market tailwinds, as evidenced by the Dollar Re-cycle signal in the Financial Force Index showing a unsettling high 4.0 in the risk calculation. I expect a US fiscal policy shift post the 2016 presidential election. However, it is likely to have a muted and delayed effect on already over-extended equity markets. The impact of any fiscal policy legislation will likely be false expectations of a life-line, followed by a downturn that will bring the inflated Fed zero interest rate driven market back to reality, quite possibly with a crescendo.